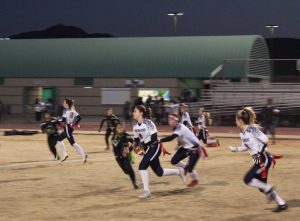 Varsity flag football was victorious in both games this week, winning at home 32-0 versus Basic on Tuesday, Jan. 8, and 21-12 on Thursday, Jan. 10 in an away game. The Cougars blew out the Wolves 32-0. Sophomore Kaylin Hall led the Cougs to victory scoring four touchdowns and completing one interception. On the receiving end, seniors Sydnee Hansen and Reagan Raimer each turned two touchdowns. Junior Payton Bard played strong defense eight tackles. Defeating the Gators, the Cougs took the win 21-12. Hall made three touchdowns and one interception, while freshman Meg Tysee scored two touchdowns. On the defensive side, senior Lexie Potts and Bard each made seven tackles. The Cougs’ next home game is on Wednesday, Jan. 16 versus Foothill at 4:30 p.m. The men’s varsity basketball team defeated Green Valley 100-74 in an away game on Monday, Jan. 7. The Cougs took the lead in the first quarter, and their strong defense kept the Green Valley Gators behind for the rest of the game. Sophomore Jaden Hardy (#1) scored 31 points for the Cougs along with junior Tyrell Hunt’s (#10) 23 points. Next the Cougars won against Liberty 97-78 on Wednesday, Jan. 9. Freshman Richard Isaacs (#2) had four rebounds and junior Max Howard (#21) had five rebounds. Varsity plays the Foothill Falcons at home on Tuesday, Jan. 15 at 6:00pm. Women’s varsity basketball lost to Green Valley 46-65 in an away game on Monday, Jan. 7 and lost 46-54 against Liberty on Wednesday, Jan. 9. 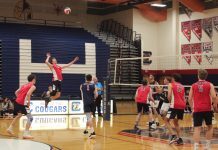 The game was close in the first quarter, the Cougs were only down by a point but Liberty’s strong attacks held the lead and defeated the Cougars. 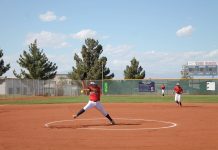 The women’s varsity team will face off against Foothill at home on Tuesday, Jan. 15 at 5:00 p.m.